AmazeBox - What's in yours? | Personalised occasion-specific gift boxes / flower cards from just £9.99! Want To Earn A Free AmazeBox? 1. Buy (or receive) an AmazeBox. 2. Share the Personal Referral Code we give you. 3. When someone uses it to order, you claim 25% off! Find out more about the AmazeBox Referral Scheme. Which gift box would you like to send? Why should you send an AmazeBox today? We help you send unique, personalised and relevant gifts to anyone, within moments, for less than £10. Like a flower card or a personalised greetings card...but better! We've combined web magic with diligent product research and meticulous design to ensure you can send something that makes sense for every occasion and every relationship. What makes an AmazeBox such a great gift? A fun and unique gift box that you can't buy anywhere else. 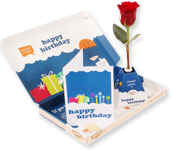 A wide selection of gifts which complement the gift box & greetings card and suit the occasion and relationship. A number of customisation options such as photos messages, deluxe gifts and a personalised gift box. You answer a couple of simple questions above and we generate a recommended box for you. You then review, amend or upgrade the contents as you see fit. We then pick & pack your box and send it to the recipient's address (the AmazeBox fits through a letter box so it doesn't matter if they're not home to receive it). Who is behind AmazeBox & why? 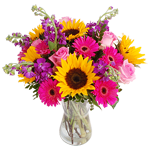 AmazeBox is brought to you by the team who founded Arena Flowers and built it into one of the UK's best flower delivery businesses. We source all our own products from the best suppliers, be it rose growers in Kenya and The Netherlands or chocolate suppliers in the UK. We created AmazeBox because there's currently no fun, occasion-led gift that's more than just a greetings card but less than a full bunch of flowers. AmazeBox fills that gap.